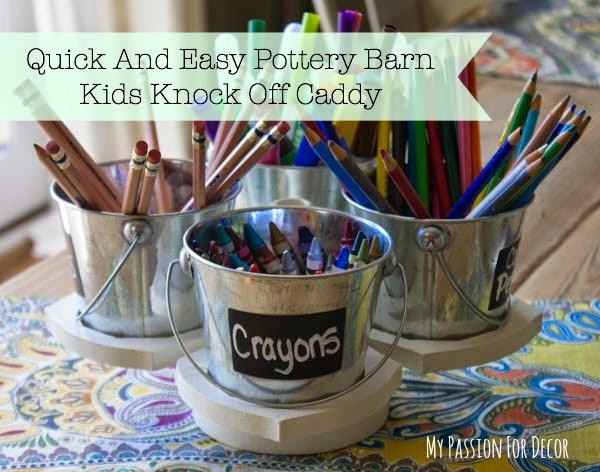 Today I'm sharing a quick and easy Pottery Barn Kids knock off. 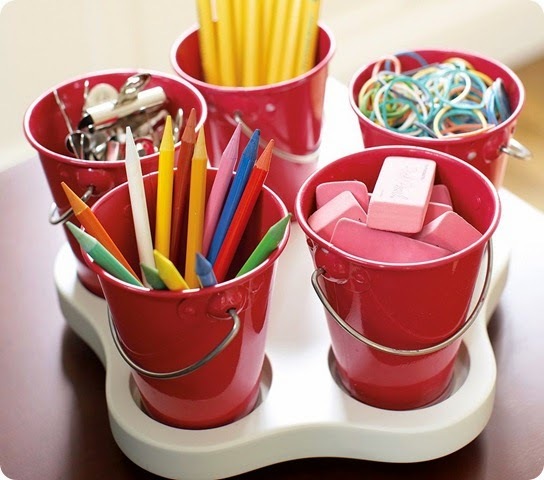 Since Hunter was old enough to enjoy crafts, I've been wanting to buy a Pottery Barn Kid's lazy Susan caddy. There were times in the past I would go to PBK and put the caddy on the counter while I looked around, but I just couldn't see spending the $40 or so dollars on something I could do myself. 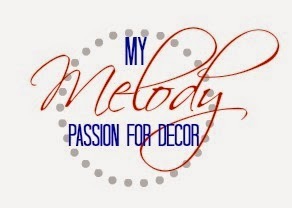 This idea kept getting put on the back burner, until I spied just the items I needed to make my own at Goodwill and Target! Here is my inspiration for the knock off. This cute and colorful lazy Susan caddy, but for $40? NO thanks!! All you need to make you own knock off caddy is some paint, a spinning caddy (preferably one that will fit you containers) and four containers to fit the caddy. For paint, I used what I had on hand. 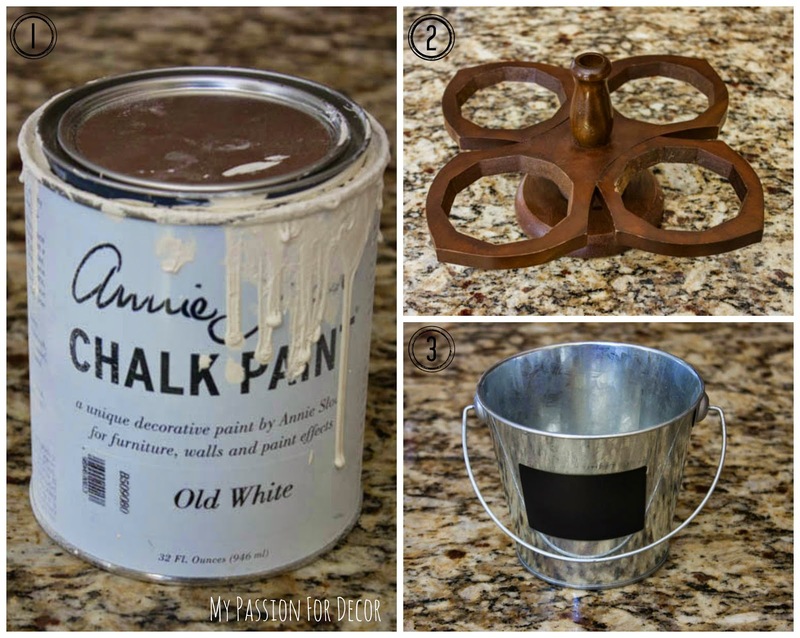 I hand some Old White Chalk Paint™ decorative paint by Annie Sloan. I painted the caddy with two coats of paint and I was done From start to finish, including drying time, this whole project took about an hour to finish. My lazy susan caddy, I found at Goodwill for $2. I'm not sure exactly what it was used for, but I know I've come across them in the past at thrift stores, but didn't clue in on what to do with it until last week! For my containers, I used galvanized buckets I found in the $1 spot at Target. I was happy they had chalkboard labels already on them which was a huge bonus. 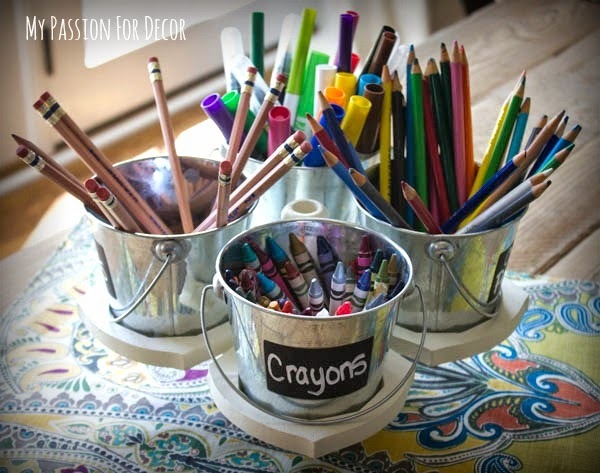 Your containers don't need to have labels, because it's easy to add you own with stick on chalkboard labels. If I hadn't found the containers with labels I wouldn't have added them. 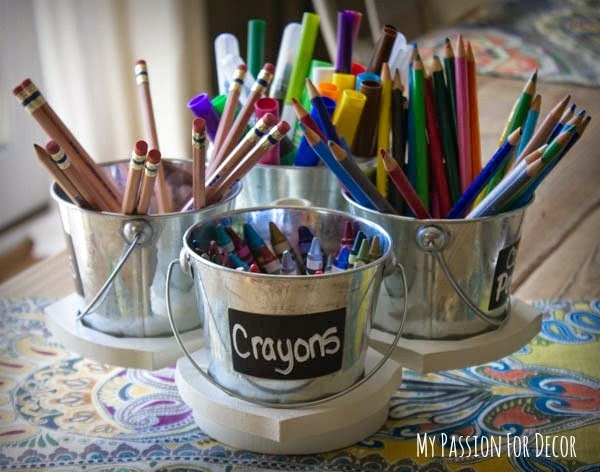 I wrote on each chalkboard label with a liquid chalk pen I had on hand, then placed each container in one of the openings in the caddy and I was done. All I needed to do was fill up them up. Hunter was happy to help me with this task. He chose what he wanted in each container and then we were finished. Here's the finished Pottery Barn Kids knock off caddy! The total cost of my knock off caddy was $6! I like that price a whole lot better than $40! Hunter was very happy with this project. He thinks it's cool how he can see all of his supplies and then just spin the caddy to get the supply he needs. This caddy is now home in Hunter's new office space. I will be sharing more of this space soon. I can tell you that he was excited when he came home from school and saw his new space. He told me, "I'm going upstairs to do my homework....I have a job to do!" If it gets him excited about homework, then I'm all for it! Your knockoff looks better than the one sold by Pottery Barn (BTW, their version looks rather cheap).